Scottish Football League clubs are worried they would be underrepresented in a proposed merger with the Scottish Premier League. Joining the league bodies for the season after next will be discussed during Friday's SFL ballot on the future of newco Rangers. SPL clubs hope to have a numerical advantage on a future board but SFL outfits are unlikely to support this. The SFL board will meet on Wednesday ahead of Friday's vote. Chief executive David Longmuir, president Jim Ballantyne [Airdrie Utd] and vice president Ewen Cameron [Alloa] are on the SFL board. They are joined by Gordon McDougall [Livingston], Kenny Ferguson [Brechin], Malky MacKay [Queen's Park], Jim Leishman [Dunfermline], Ann McKeown [Arbroath] and Gilbert Lawrie [Dumbarton]. At the 13 July Hampden meeting it will be decided whether newco Rangers should be admitted into Division One or Division Three. Talks have been ongoing between the SFL, SPL and Scottish Football Association and a package of reforms, including the merger of governing bodies, play-offs and revenue distribution, could be used to persuade clubs to allow the new Rangers to start life in Scotland's second tier rather than at the bottom. Clubs attending the SFL's special meeting at will be asked to vote in three stages. Instead the new Rangers could start life in Scottish Division One or Three. First, they will be asked to agree to the admission of Sevco Scotland Limited, who bought Rangers' assets after the old company headed for liquidation, as a member to the SFL. Should that be carried, they will then be asked to vote on admitting Rangers to Division Three unless, by the time of the meeting, the SFL board has reached an agreement with the SPL and the Scottish Football Association and recommends its approval to allow the new club to play in Division One. They will then be asked to approve the resignation of either Dundee or Dunfermline once the SPL has decided which of those clubs should replace the old Rangers in the top flight. 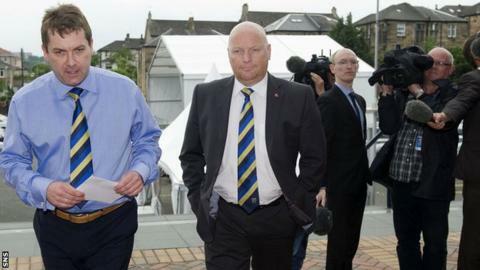 Clyde have since hit out at the resolutions, saying "it is impossible to vote with any logic" in favour of any of them. The Division Three outfit is of the opinion that SFL clubs are "being asked to make one of the most important decisions for Scottish football in a vacuum devoid of factual information".